Gake no Ue no Ponyo, which is literally translated to English as Ponyo on the Cliff, is the brainchild of Hayao Mizayaki. His latest, Gake no Ue no Ponyo, is no less than a hit as well. With more than 1.25 million people watching it on its opening weekend, the movie earned almost 1.6 billion yen! The title character, Ponyo (voice by Yuria Nara), is a girl fish with a human face who decides one day to leave her underwater home – and her school of smaller sisters – to see what lies on the surface. Riding on the back of a jellyfish, she is nearly trapped by a drift net, but escapes – with her head stuck in a glass jar. 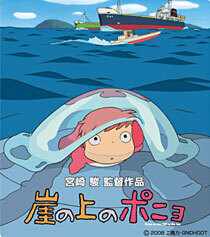 Sosuke (Hiroki Doi), a boy who lives on a house on a seaside cliff, spots Ponyo in the shallows and rescues her. He is delighted with his new pet and Ponyo is delighted to be in the human world at last. She says her first words, to Sosuke’s astonishment, and begins a transformation from half-fish to human. I’ll stop there in case you haven’t watched it yet, and if that is the case, you really need to get your hands on a copy.